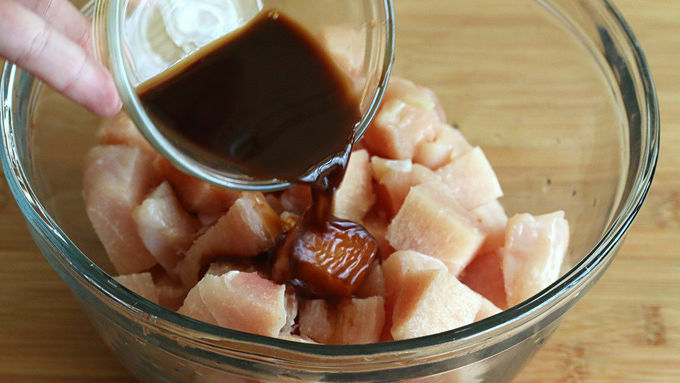 Combine the marinade ingredients in a small bowl and pour over the chicken pieces. Toss to coat and let the chicken sit while you prepare the rest of the ingredients. 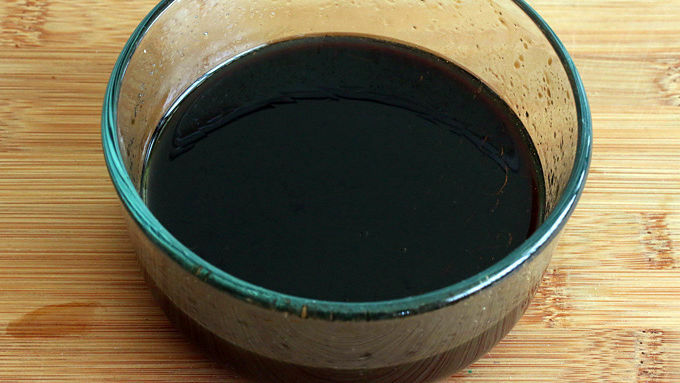 Combine all the sauce ingredients in a bowl, stirring until the cornstarch and sugar is dissolved. Set aside. Heat the oil in a wok or skillet over high heat. Fry the chilies for a few seconds until they turn darker in color. Add the chicken and marinade and fry until no longer pink. Add the garlic, ginger, and white parts of the green onions and fry for two minutes. Add the sauce and stir until thickened. Reduce the heat to medium-high and stir in the peanuts. Simmer for one minute. Remove from heat and stir in the green onions. Serve immediately with steamed rice. When working with high heat, the key is to move very quickly. Have all of your ingredients ready and laid out in advance. A Chinese take out fave that can be made right at home! This popular dish is packed with peanuts, chicken and of course, plenty of spice. Ever wonder how Kung Pao Chicken came to be? Well, let me tell you… Once upon a time in the deep forests of China during the Qing Dynasty lived a boy named Ding Baozhen (pronounced "Ting Pao-chen"). Young Ding loved to play outside, especially down by the river. One day while playing by the bank of the river he lost his footing and fell into the river. Hearing his cry for help, a nearby family rushed to his rescue and managed to pull him to safety. They carried the unconscious boy home to his parents. Years later, Ding became the governor of Sichuan. Though now a powerful leader, Ding never forgot the about the family who saved his life and sent out a query to find them. Once they were located, Ding Baozhen paid the family a visit so he could finally thank them. Now, the province of Sichuan is known for its fine cuisine and this family, hearing of his coming visit, wanted to treat the governor to a special meal. 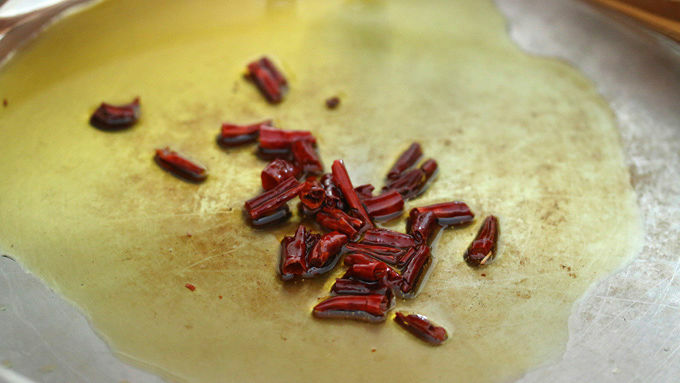 They combined chicken and peanuts in a sweet and spicy sauce and served it to Ding Baozhen who declared it "delicious". Governor Baozhen's official title was Gong Bao, pronounced "kung-pao" (meaning “palatial guardian”), and it was after him that this dish was named. 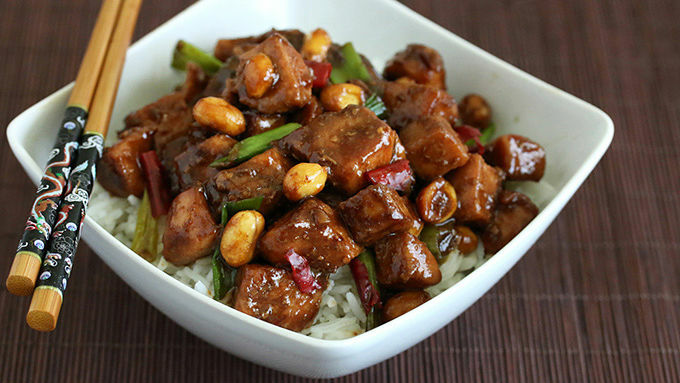 Kung Pao Chicken would go on to become one of the most beloved and popular Chinese dishes throughout China and the Western world. And the people of the world ate Kung Pao Chicken and lived happily ever after. 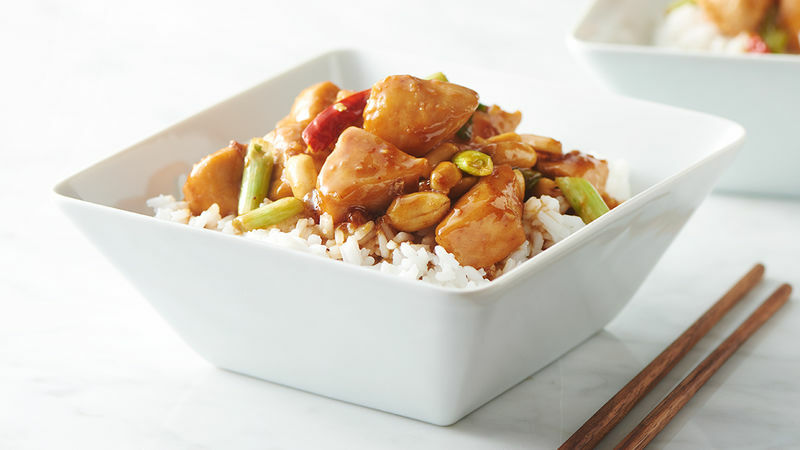 With just a few steps your Kung Pao Chicken is ready in less than 10 minutes! When working with high heat, the key is to move very quickly. Have all of your ingredients ready and laid out in advance. Serve immediately with steamed rice and a glass of ice water.